As Drones and Unmanned Aerial Systems begin to change the World, You’re invited to Learn, Build, Program and Fly Drones, Multirotors, MAVs & UAS in the heart of Venice Beach at the Ctrl.Me UAS Showroom & Makerspace/ R & D Lab. Inside the Ctrl.Me UAS Showroom, MeetUp Members can network with passionate pilots of all types, discuss the Future of UAS and their multitude of uses, learn about upcoming releases and watch custom 3D builds being printed in real-time from the Ctrl.Me product line. LA Drones & Multirotors is proud to partner with Ctrl.Me's Makerspace Lab for its Build-a-Multirotor Program --- $20 per build (up to 3 people can participate in a build). This costs only applies to those utilitizing the services of the Makerspace Lab. Attending this MeetUp is free. Builders will have full access to Ctrl.Me’s Makerspace Lab, Dedicated assistance from Ctrl.Me’s team, Lessons and Support on the basic fundamentals, component functions, controller configuration, indoor testing & troubleshooting. Completed Builds generally take 1-3 sessions and All Flights are Guaranteed with purchases made from Ctrl.Me. For more information on Drones, UAS and Multirotors, Please visit http://Ctrl.Me/Quadcopters-101 LA Drones and Multirotors MeetUps for Learning, Building, Developing and Flying are every Sunday from 1-5pm, across from Vice News and Lemonade on Abbot Kinney at Venice Blvd. with free parking. Feel free to contact us with any questions. We look forward to flying with together! A celebration of robots at the Long Beach Sea Base! Please bring your robot to share! Lots of robots, electronics, hands on, drawn, and more! We will also kick off the BrickQuilt project! In conjunction with National Robotics Week, the Consortium for Robotics and Unmanned Systems Education and Research (CRUSER) at the Naval Postgraduate School (NPS) will hold its 3rd annual Technical Continuum (TechCon) on Tuesday and Wednesday, April 8th and 9th 2014 on the NPS campus in Monterey CA. TechCon is designed for all NPS students and faculty interested in education, experimentation and research related to employing unmanned systems in operational environments. Our intent with TechCon is to showcase concepts of interest from recent Warfare Innovation Workshops, highlight currently funded research, and offer a venue to discuss potential FY15 research interests. All presentations are unclassified. Although the CRUSER TechCon is free and open to the public, the campus is not. Gate access will need to be arranged. 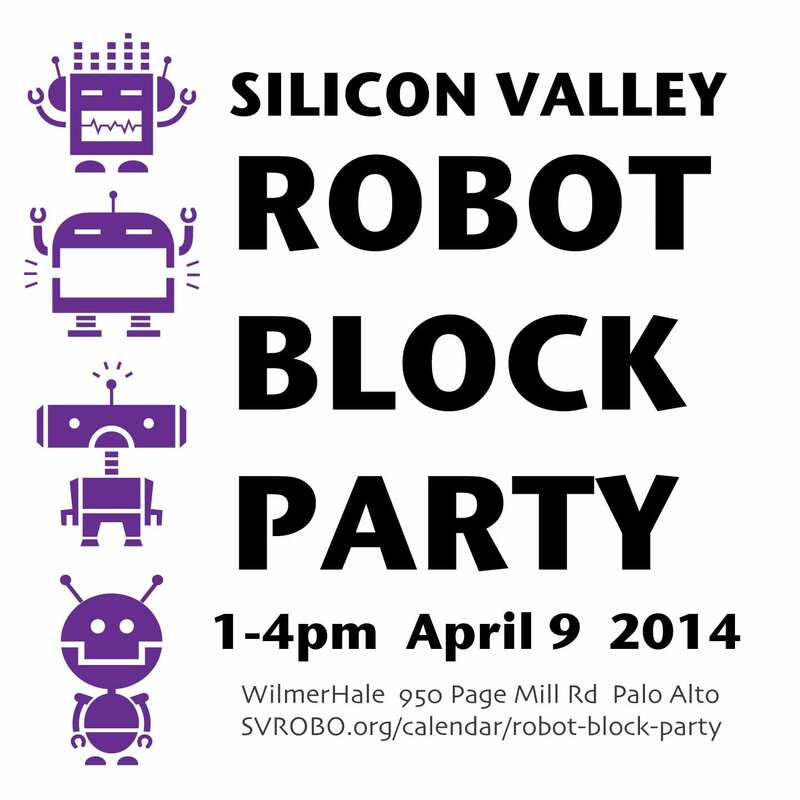 Celebrate National Robotics Week with Silicon Valley Robotics at WilmerHale in Palo Alto. See the most advanced robotics research in Silicon Valley, the hottest robot startups, the coolest robot companies and all the just plain fun robots you can imagine. This will be our fifth year of holding the most amazing Robot Block Party ever, so whether you know your way around with lidar and ROS or just want to make a robot dance - come join us! It's a free event and open to the public from 1-4pm. Have you ever wondered what electrical engineering really is? What makes a robot a robot? Join Allen Pan as he demystifies circuits, electronic component, micro-controllers, bread boards, transistors and more. You will get learn enough electronics to get you on the path to exploring Arduino projects and inspire you to learn more. A great 6 part introduction into how electronics can translate into useful objects in our world. Yaskawa Motoman, a leading robotics company in the Americas, is hosting educational events at our facility in Irvine, CA on April 10. HIGH SCHOOL AND COLLEGE STUDENTS highly interested in robotics and automation technology are welcome to attend. Visits will include a tour of our robotics lab to see and interact with live demonstrations. Students will have the opportunity to talk to engineers and technicians regarding automation and career opportunities. One-hour sessions are available with a limit of 25 students per group. Registration is required. Session times: 9:00 – 10:00 am; 1:00 – 2:00 pm. More times may be added as required. To schedule your group, please contact Diane Burton: diane.burton@motoman.com or call 949-263-2654. USC Viterbi School of Engineering opens its robotics labs to the public, schools, and industry for tours, demonstrations, and activities. From April 7th to the 11th, 40 High School students are participating in a one week camp called QWOW! or Qualcomm World of Work. The purpose is to provide students with exposure to the broad world of work at Qualcomm, especially in STEM careers. As part of this camp, one day is focused on robotics. Students will work with Arduino to create RoboFloats with the help of local FIRST teams that will be helping with and judging the RoboFloat projects. The Thinkabit Lab is a dedicated Qualcomm space that is part makerspace, lab and classroom for students, primarily at the middle school level, to experience STEAM via hands on projects lead by Qualcomm engineers. The Consortium for Robotics and Unmanned Systems Education and Research (CRUSER) at the Naval Postgraduate School (NPS) is pleased to announce our annual research fair will be held on the afternoon of Thursday 10 May 2014 on the NPS campus in Monterey CA. This annual “Robots in the Roses” research fair is an opportunity for the NPS CRUSER community of interest members to showcase their work, and attract thesis students. It is also an opportunity for new and continuing NPS students to survey the work of campus researchers and survey potential thesis topics. This research fair has also proved to be a very effective vehicle for STEM outreach, as we have incorporated community partners to offer a hands-on robotics related activity for elementary and secondary students. Local high school robotics clubs are also included, and the venue allows them valuable interaction with NPS robotics researchers and students. In honor of National Robotics Week, FANUC America is hosting facility tours and demonstrations. Students, parents and school faculty are invited to this special automation event. Please register to attend a one-hour session. To celebrate the National Robotics Week and support the YWCA of Santa Monica, Rolling Robots will participate the Santa Monica Global Festival at 3rd St Promenade, Santa Monica on April 11, 12 and 13 from 10am to 10pm. We will demonstrate how to build a remote control robot from scratch, and show off the robots built by Rolling Robots Roboteers (members of Rolling Robots Roboteers Club). We will also bring lots of D.I.Y. robotic, electronic, and mechanical kits with us for those who are excited to build their own machines at home. So come to celebrate the National Robotics Week with #RollingRobots @SantaMonica Global Festival. More info: www.RollingRobots.com, www.global-festival.com. LEGOs and robots are a perfect mix; in this club we’ll be using the LEGO Mindstorms NXT robot kit to design, build, and program robots to perform, compete, and amaze! The Mindstorms software teaches basic programming and robotics concepts in an easy-to-learn and kid-friendly environment. Students will collaborate in small groups, working together to design and build in an atmosphere of friendly competition. Students need no prior experience with LEGO Mindstorms, or computer programming in order to attend. Will your robot conquer The Gauntlet of The Exploratory? You will have 48 hours to build a robot that will be able to conquer our six-stage obstacle course. Bring your micro controller development board and we will provide you a Challenge Bot Box at the maker space to build your robot. The Grand Prize will be free membership to The Exploratory for 1 year ($1200 value)! How it works: Purchase a Challenge Bot Box at The Exploratory. Pre-order your box before April 9th for $50, or $75 thereafter. You can pick up your box on Friday, April 11 after 5pm. Building of the robots will commence at 6pm on Friday, April 11. Make sure to bring your laptop and preferred micro controller development board. Doors close at 10pm. The Exploratory will be open from 9am-9pm on Saturday and Sunday from 9am-5pm for you to come in and use the space to build your robot. You must know how to code for your robot. There will be no teachers or tutorials at this event. Throughout the 48 hours, you can test your bot as many times as you like on the obstacle course. You must leave your bot here. You may not take it home to work on it during the challenge. To win the Grand Prize, your bot will need to finish the course in the shortest amount of time. *Owners of Lego Mindstorm (not part of challenge) can do the obstacle course for free. We are hosting ROBOTIS STEAM CUP at the OC Fair Grounds Imaginology! You can come and compete in the ROBOTIS STEAM CUP with our on-site, hands-on robots and win prizes! Our booth will also have, several activities to have fun and explorer with robots. There will be bug bot battles, bug bot obstacle courses, bug bot soccer, and free building! ROBOTIS is a manufacturer and developer of innovative teaching and learning solutions for STEM education. Our fun and educational robotic platforms are used worldwide. We offer classes, seasonal camps, event activities, birthday parties, teacher workshops and more! 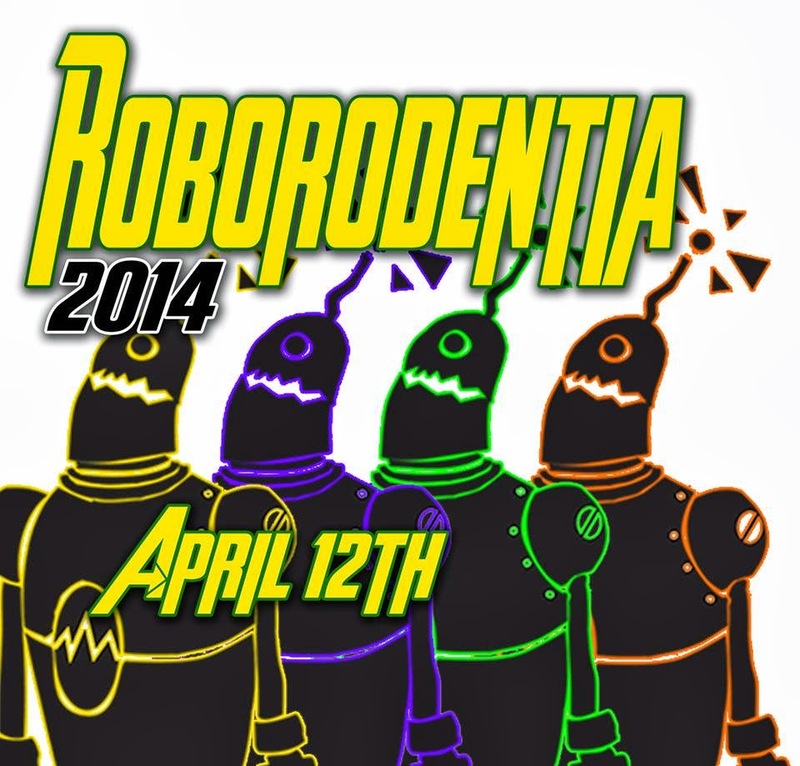 Roborodentia is an annual robotics competition at Cal Poly held during Cal Poly Open House in April. The event draws over 1000+ spectators and over 15 robot entries and teams on a yearly basis. RSSC is an experimental robotics association formed in 1989 around the time when many computer clubs where being formed. The need for robotics specific club was met by forming one of the first robotics clubs in the world. We meet once a month on the second Saturday of the month at California State University Long Beach in the ECS building, room 302. Parking is free on the street. Our meetings start at 10 AM with classes, special interest groups on subjects such as AI, motor control to a short business meeting followed by a short break then a competition plus a show and tell of the various projects our members are working on and it ends around 3pm. See Announcements on the right of this page for the latest topics. Our society is FREE to join for anyone interested in robotics and other exponential technologies such as 3D printing and Artificial Intelligence www.leafproject.org and for any age group! Come and learn! We have presenters from student projects, Battlbot builders to Mars rover drivers and leaders from the robotics community. Bakersfield Robotics Robot Block Party is an opportunity to educate and inspire youth and adults in the fields of science, technology, engineering, and mathematics. This family-friendly event will provide hands-on activities and robot demonstrations to showcase the Robotic community. Come check us out! Admission is free. The VEX Robotics World Championship brings together top robotics teams to celebrate their accomplishments and compete with and against the best teams from around the world. The 2014 VEX Robotics World Championship will include top teams from over 400 VEX Robotics Competition tournaments happening in cities around the world from June 2013 to March 2014. Teams will play the game Add It Up during the 2013-2014 season.